I have managed to plant the tree grafts that I bought at the bourse aux greffons, despite the cold weather. I heeled the trees in for a couple of days while I did the preparatory work. I chose a South-facing planting area where the trees, once grown, will help to sreen the compost heap and water butts. First, I took the turf off, the dug over the area and rotavated it. I then added peat and farmyard manure (I cheated and bought concentrated stuff). Then I hammered in the stakes and strung wire supports between them, and finally I planted the trees. You can hardly see the little brown twigs against the soil. Now I know that tree grafts don't always take, and I might end up with one or two dead twigs instead of healthy productive trees. But then, I figure that I have done the hard work already: preparing the planting area took several hours, and also involved buying manure, stakes and wire, but the final job of getting the trees into the ground was a matter of minutes. And buying them was fun, and I could always get some more next year. On the left, no pile of stones. On the right, a new wall. There were even some stones left over to help towards some walls elsewhere in the garden. Though I am clearly going to have to do something about that big patch of mud. We were down the road enjoying a morning coffee at Marie's the other day, when we noticed a little advert stuck to the door for a "bourse aux greffons" not far away. A bourse translates in this case as something like an exchange, as in stock exchange, and greffon is a graft, also to mean a grafted tree. The advert mentioned apples, pears, quince and plums, and being generally interested in garden-related things, we decided to take a look. So this morning, a cold and misty Sunday we took a 20-minute amble in the car down some country lanes to the Château de Verdelles. We got there 10 minutes after opening, and the place was already busy. The bourse was in a converted barn, and there were more varieties of apples, pears, quince, and so on, than... well... than you could shake a stick at. I think the event is organised by a club of fruit tree enthusiasts: there were old as well as modern varieties there, and also some with strange descriptions like "on the road to Le Mans"
Apple trees don't breed true from seed, so if you want to ensure that you get the right type of apples, you have to make a new plant using genetic material from an existing tree. The easiest way of doing this is to graft a scion onto a root stock, and this gives the advantage that by selecting the right root stock, you can also determine the final height of your tree. So on the central table were laid out, carefully labelled, little piles of scions from all sorts of fruit trees. At one end of the room there were heaps of root stocks, and at the other end of the room were guys who would graft the one to t'other for you. The scion would cost you a euro, the root stock 2, and the grafting 2, so you could get a fresh graft for 5 euros. You could also bring your own root, your own scion, or take things home and do the grafting yourself if you wanted. Grafts are not always successful, but even so, an apple tree of your choice for 5 euros is not to be sniffed at. Well, I've had this idea sitting at the back of my head for a while, that it would be nice to have some espaliered fruit trees somewhere about. If I'm honest, it's because I've been seduced by the wonderfully-managed examples that I've seen in stately gardens. So, even though I have not prepared anywhere to put them, I failed to resist the temptation to buy 4 trees. Firstly, I chose 4 different varieties of scion: Reinette Clochard, Reinette d'Armorique, Winter Banana and Grand Alexandre. I then chose root stock that will allow compact growth of espaliered trees. The last stage of the process was getting the scions grafted onto the roots, and these pics below show how it was done: saw the root stock down to length; split the end of it with a curved knife and mallet; wedge the resulting slit open with a screwdriver; insert the tapered end of the scion into the split so the two green growing bits touch; remove the screwdriver and bind the result; wax the join to protect it. One of the unexpected pleasures of planting a garden is the exchange of gifts between gardening friends. It is the natural result of growth: when a plant gets too big, you divide it up and give away the surplus. This results not only in a gift that continues to give pleasure over long periods, but also means that a clone of the plant is alive and well not too far away, as a backup in case disaster overcomes one's own plant. At this time of year, colour in the garden is rare and special. 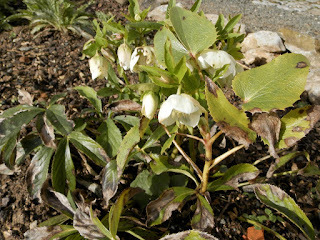 These two Hellebores are both gifts; the green one on the right from Leo and the white one on the left from Mum. The green one has been in place for a few years now and is thriving after a slightly dodgy start. It looks to me like Helleborus Foetidus, the stinking Hellebore, though I haven't noticed a bad smell. The white one looks a bit tatty at the moment but I think it will be fine. The flowers are shy but pretty and worth the effort to seek them out. And Spring can't be far away because I have the first Daff out. As long as we don't get a nasty -15° frost between now and spring (like we did last year, and that clobbered all the daffs), I am hoping for plenty more of the same. St Valentine's day, in England at least, seems to have lost its saintly prefix, and is know simply as Valentine's day. I have always know this day as a celebration of love, specifically sexual love. In the UK one sends a card to one's beloved, or, if single, to someone you fancy. A gift and/or a romantic meal is in order. In the US, where greetings card manufactureres have had even more marketing success, it is also considered normal to send cards to family members; brothers, sisters, etc, a practice that would raise eyebrows in the UK. In France, they announce, along with tomorrow's weather forecast on TF1, (the main national TV channel) the name of the saint associated with that day. If one has the same forename as the saint, one is wished "bonne fête" by friends on the day. And Valentine's day is known as St Valentine's day. The card manufacturers in France are clearly missing a trick, because there are no cards to be found. The day is certainly celebrated, and Marie who runs the restaurant down the road is offering a special romantic meal for the occasion. But at Sunday lunch next weekend. So here's some flowers, bought for my dear wife. It's interesting to note that the addition of a great big spread of decorative paper around the flowers makes them look much bigger, and costs the vendor next to nothing. Do they do that in the UK now? The French would use the word "bilan (m)" to describe a review of the results. It's also used for the bottom line on company accounts. Spring tends to arrive more or less at the same time each year, so it really shouldn't be a surprise, but I find that I'm not prepared, and already the earliest seeds need planting. I planted two types of pepper seeds in the propagator (present from Mum) yesterday: the chilli peppers are the remainder from last year's seed packet, and the bell peppers were collected from some particularly nice fruit we prepared for gîte guests. So they should be OK as long as they weren't irradiated. Of course I forgot to label them so I don't know which tray is which, but I should be able to tell when they grow. I hope. I'll have to do the aubergines soon, too. They seem to grow well outdoors; a neighbour up the road had huge ones outside last year. The tomatoes were a dead loss last year, it was too wet and they rotted. The only successes I saw elsewhere were from plants that had been drenched in bordeaux mix, a technique I shall use if we have the same problem again. The leeks were successful, but there were only 16 plants and they ran out in December. I will have to grow more this year, they are a useful ingredient in lots of Winter recipies. On the other hand, I had about 10 sprout plants, and only needed 4 or 5, so fewer of those this time. I'll do the sweet onion Walla-Walla again, too; they were great. The parsnips were a complete failure, I didn't manage to keep them weed-free, and since they germinate slowly, they got swamped. This year I, have a cunning plan to plant them in seed compost in loo roll centres, and then put them in the veg plot using a dibber, rather like leeks. I expect that the compost should be weed-free, and the loo roll holder should mark the position of the parsnip seedlings to make it easier to weed. I grew one butternut squash plant, and this yielded 5 fruits. There are still two left, so I think I'll do the same this year. I was worried that the plant only made male flowers at first, but the female ones came along in the end, and there were enough male flowers still around to fertilise them. The purple sprouting broccoli looks like it will give a decent crop, but it's due later in Spring, so I don't know yet. But since the plants look strong, I bought some more seed for this year. There was no need for me to plant parsley, because it self-seeded all over the kitchen bed. I collected a lot of coriander seed, and I'll put that there too, in successive sowings, along with basil. Looking froward to 2013, I seem to have excelled myself in seed collection last year. I have numerous white envelopes marked with things like "big yellow melon", "orange pumpkin", and so on. Plus, copious seeds from delphiniums, cosmos, marigolds and tree lupins. There is also seed "Cerinthe Major Purpurascens" from a client from the gîte (swapped for some tree lupin seeds), so I will give that a try. I will be trying a seed tape from Suttons' Seeds, of spring onions. The French don't do spring onions as we know them. They call them "petits oignons" and they wait until a small (one inch) bulb forms before harvesting them. By this time, the green tops have deteriorated, so you miss out on the special white/green juicy mild flavour. The long tassels of Garrya Elliptica are starting to come out, bringing an elegant splash of yellow to this otherwise bleak season. I have three plants growing in poor soil against a North-East-facing stone wall, and this is one of the few attractive shrubs that will thrive in this difficult situation. Although the the tassels don't currently stand out well against the wall, the idea is that the evergreen leaves will ultimately allow them to display themselves. I have had difficulty in taking cuttings of this plant: no success so far. I did accidentally get a layer from a branch that was touching the ground and had rooted, but separating it and replanting it caused it to die. Perhaps the roots are sensitive to disturbance. In any case I will try layering again this year, and be more careful about the repotting.